Our three-part guide to 'Going to Court' covered all the issues you might experience throughout the court process. Many people experience issues after a court order has been made - and this guide "After the Initial Court Order" is aimed at helping you through difficulties following a court ruling. It is always important to keep a record of any breaches of a court order, however minor. Whilst it may not seem important at the time that a payment was a couple of days late or a couple of pounds short, these minor breaches all add up. A series of minor breaches on top of a more major breach of an order (such as a payment missed altogether) may be the evidence that makes a difference between a judge just giving your ex partner 'a telling off' and be told not to breach the order again, and the judge altering the order (to reduce contact or make them pay a month in advance). It is also important to keep track of any communication with your partner, even if it is just a 'courtesy call' in which there were no disagreements or agreements made. This will enable you to easily refer to exactly what was said (particularly if in person or over the phone) at a later date. Your diary entries / notes don't have to be long. For Example: 21/08/12 - Mark dropped Katy off at 8pm as agreed. He said she had been out with her friends at the shops all afternoon and had not had tea. It is also worth if anything is agreed (in person or over the phone) to confirm this in writing (email is fine) with your ex partner. They do not have to reply, but they have then had the option to object if this was not their recollection of the situation. If your ex partner repeatedly or seriously breaches the court order, you can apply to the courts to enforce the order. All contact orders after 2008 contain a warning about what could happen if an order is breached. If your order is breached, you need to ensure that you have an attached warning notice. You can then apply for enforcement of your order. The police will then only become involved if there are repeated serious breaches and the court punishes your ex partner via community service (or, in rare cases, imprisonment). The police will not immediately get involved in enforcing a court order relating to children if they are with someone with parental responsibility, even if you make allegations of abuse. The correct procedure should you wish to make allegations of abuse is to make an emergency (same day) application to the courts. The police may then be used to enforce that court order, accompanying a Children and Family Court Advisory and Support Service (CAFCASS) officer to remove children from a party's care. Clearly the easiest way to agree contact arrangements is between you and your ex partner, clarifying arrangements in writing. If this is the case and you wish to change your contact arrangements, you can simply ask to have a discussion with them and set new arrangements. Talk to your ex partner and explain what you want to change and why. If it works out better for both of you they might not object. Go your solicitor and draft a letter to your ex partner setting out the arrangements you wish to change in a more official manner on their letterhead. If neither of the above has settled matters, apply to the courts to decide your contact arrangements again. Going back to court takes time and money, so it is important to consider a) how important it is that you make changes to the current arrangements (especially if they work) and b) how major are your changes. If your changes are purely for convenience, but can still work now, then it is really not cost effective to take your ex partner back to court if they won't agree to them. Equally if your change is to which evening you have the children (e.g. Weds / Thurs) or what time they are returned (1pm / 2pm), there is also little point in taking this matter to court. Remember the No Order Principle: the courts will not make an order, if the position is no worse if they don't make an order than if they do. In some cases the child may state that they do not want to have any contact with the non resident parent, this is sometimes due to the fact that the resident parent has alienated the child from the other parent. This is known by some as parental alienation, this is a controversial pathological ailment most commonly claimed during divorce or separation of parents. Symptoms of parental alienation are expressed as unjustified extreme hatred for one parent. Parental alienation remains a controversial condition in both the legal and medical professions, as similar symptoms can easily be brought on by negative comments by the other parent, or a child blaming one party (particularly if they were unfaithful) for the relationship breaking down. 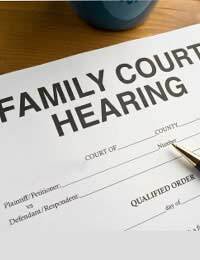 Generally legal advice would always be not to plead parental alienation in court. Judges like evidence based submissions, so if you are claiming a medical (psychological) condition, the judge will want to see a medical report to prove this. This is not the sort of report a regular GP would be able to give, so would be expensive to obtain, and many medical professionals (much like with conditions such as ME) don't recognise it as a "real" medical problem. The best way to effectively plead parental alienation would be to produce evidence in court of your child's behaviour being unsubstantiated or unreasonable. You essentially want the judge to give the wishes of your child (one item on the welfare checklist) little weight. You are far more likely to achieve this by demonstrating how good a parent you are and your closeness with your child before the separation to show how their sudden hatred is irrational. Often mention of "parental alienation syndrome", a condition proposed by controversial American psychiatrist Richard Gardner, will damage an otherwise valid point. After court letters part one. After court letters, part two. I have a court order issued via final order some 22 months ago giving strict 50/50 care of our daughter. I took my ex back to court 18 months ago and the judge went spare at us both. It was beneficial, in a much as it forced mum to talk and much of her controlling behaviour relented (for a while). Since this point, we have mutually varied the order (realistically, my ex did her own thing and contacted me last minute to arrange contact, usually 6:1/ 6:2 split over a week). For example, over the summer holidays, she saw mum 4 nights out of 7 weeks. Our daughter will be twelve 3 months. She has become used to the arrangements, living with me and very settled well (she has found the last minute ad-hoc requests for contact from mum frustrating). Mum now has a new relationship and wants to return to the 50/50 arrangement. Her communications have actually become semi-litigious, somewhat economical with the truth in an attempt to make herself look good and done nothing to build any form of trust. I have to some degree ignored them and refused to engage, par one e-mail. Our daughter is adamant that she doesn't want to return to the old court arrangement and has said she won't go to mum's after school on the set days (she's in secondary and makes her own way to school and back). I am not in the frame of mind to force her either. I have discussed it at length and established what sort of time she wants to spend with her mum. She stated throughout the last proceedings she wanted to spend more time with dad and has now got used to this. My ex isn't listening and is unilaterally trying to force through her own agenda (she is particularly controlling and very manipulative). So, do I take this back to court again? I'm of the frame of mind of letting our daughter vote with her feet and then waiting for my ex to have to deal with it as opposed to go for the head-on litigation. Maybe it's time for our daughter to have her say; or; by refusing to return, time for mum to accept some feedback? I'm not keen on the court process. My ex spouts all sorts of lies, nothing is ever looked into properly and the whole system is adversarial, which doesn't nothing to settle our daughter. TBH, I am becoming somewhat resentful of my ex, for being so selfish as to keep putting our daughter through this and praying on her emotions. She is so selfish. Thoughts please. hi, just after a little bit of advice. I have been to court and won contact with my daughter for one day a week, progressing to two days and currently it is on tow days, one overnight stay. My ex has recently had a baby so hasn't been working. I however, works shift work and my ex is aware of my shift pattern being 4 days in 4 days off. She has been happy for me to see my daughter on every second day and third day of my days off. Now she is telling me I might need to change my days when she goes back to work as it might stop her from seeing our daughter all the time, depending on her work pattern. Her work rota changes on a monthly basis whereas mine is the same all year around. She has explained that days might need to change so she can get to see our daughter too, but our daughter lives with her. She has also told me that she is moving, and after recently agreeing that if both of our partners cant drop off/pick up our daughter, then we are to meet at a public place. This has been fine until she has decided to move, to which I have asked to meet at a public place which is in the middle for us both, at the designated time we have previously agreed. She has now told me that due to her other childs sleeping times, I will either have to drop my daughter off at her home, even though there have been allegations of domestic abuse, hence why I am more confortable with a public place. Or I need to meet at a public place earlier, which then reduces my time with my daughter. She also stated that if im not happy with that then I am to change my days, which is practically impossible due to work commitments. I feel really lost as I have requested that we go to mediation to resolve this matter, to which she declined as she stated she isn't paying for mediation so I might as well take her back to court. I feel like if I don't agree to her way then my contact with my daughter will be affected. As she has stated I wont be getting my daughter if she cant get back home to hers, but wont agree on anything auitable for both parts, just for the simple fact she has another child. Me and my partner are due a baby in 3 months. His ex stopped contact with his 2 previous daughters for lots of various reasons over the past 1 1/2 years. Latest being their 7 year old can’t deal with change so meeting me or a new sibling would put too much strain on her. He applied for court order and first hearing was awarded interim contact of mon-thur-Friday over night until 7 pm Saturday. And the second week the same with no weekend. Conditions attached are I am introduced 2 hours only every other sat. When baby is born another 3 months of me and baby allowed contact 2 hours every other Saturday. Not allowed at my property. Not allowed our previous children to meet. This seems so strict considering we were going to move in together before baby arrives and now we can’t. I’ll be left 4 days and nights one week to manage alone. I’m not sure how I’ll manage after a c section without his help and other children to care for. There are no safeguarding concerns on me or him just the daughters ‘apparent’ struggle with change. (Mums introduced new partner all was fine and moved 4 times in 7 years) he was a litigant in person and she had a solicitor and he felt bullied to agree or lose interim contact altogether. Just seems 24 hours over 6 months to adapt to me and a baby in their lives is ridiculous. Everything now has to change and he can’t wven have all 3 of his children together for more than 2 hours a fortnight. Can he appeal interim contact? He will have to have all this contact at his dads then at final hearing is he allowed to move in? I doubt that would then be allowed given they would have spent such little time with me and a baby and no time with children already living here. Really at a loss as to what we are able to do. How can we be expected to have a baby so soon and under these conditions. How is this fair on the children. Vindictive parenta punishing children for their own gain really get to me. What’s the next step other than waiting 6 months? My partner has just been to court and won his case for access to his daughter. In court they stated that the order would allow him to see her regularly as well as have her for holidays, take her abroad, and have her on Father’s Day and alternate christmases and birthdays. We have recently received the written court order in the post and it does not have anything in it about the alternate Birthday, Christmas, having her every Father’s Day or being able to take her abroad on holiday. This was all stated verbally to him and his ex in court but she is extremely awkward and will probably use the fact that it is not in writing in the court order to stop it from happening. Is it possible to get these added to the order and if so how do we go about doing that? I. The draft copy that was scribbled down at the final court hearing it does state everything that was discussed but in the proper printed copy, it has missed bits out? Do you have any advise please as my partner has been through so much stress trying to get this order and I just don’t want his ex to start trying to use loop holes to prevent him having his daughter as agreed. My ex and I was in court because of her very heavy and erratic drinking. She is a binge alcoholic basically and once she starts she won’t stop, whatever time of day it is. The court case went on for almost two years whilst I had the kids with me for 2 years whilst she had supervised contact. After 3 months of clear testing the court gave her 3 days per week overnight. After 3 months of the order she literally went back to her old ways and has been up and down constantly. My kids routine keep having to change and ideally they need stability now for school. My question is what will the court do if I apply to the court to vary the order? Will they just keep giving her chances or will they cut her days down to possibly once per week and that be the end of it? @zoe27.i think he does care about his child .i think his mother hates you with( good reason )and the only one not in a fit state is (you) .i think you are alienating the father and twisting everything around to make the( father look bad) .becuase you know you are in the wrong and feel( awkward with guilt) because your lieing hasbeen exposed for a (scheming vindictive jealous ex )because your ex (upgraded from you) .and the only way you feel in control is stopping access to his child you women are all the same text book . Hi, my ex and I couldn’t agree over several issues such the child’s surname (has mine since birth 3 years ago but ex wants his name used), where our child will live And what contact arrangements to follow. A child arrangement order was made with myself and the child able to live abroad in (both child and I are Belgians and my ex is British residing in England) and her father was to visit monthly and the name would not be changed. One of the conditions of the court order was for the father to register the court order abroad where I live and that the courts in Belgium has jurisdiction over PR and family matters involving our child. To date, he has not registered the court order, not visited regularly (only visited once and there are no plans for future visits) but had sent me an email stating he will put himself on the English birth certificate and change our child’s name in England and that he is fully capable to do so without my consent. My understanding is that if he wanted to change any of the agreements made in the order then we would need to go back to court, is this correct? My concern is that I’m being told he can go and change whatever he likes without going back to court even though we went to court to agree on these matters and now he’s changed his mind and I’m concerned how it works as we are an international family with different laws in each country. As far as I am aware, because he has not registered and activated the court order in Belgium, it does not apply here but would apply if my child and I were to be in England for any length of time although there are no plans to go to England. Your child's father would not be able to change the contact order and/or agreement unless he referred the matter back to court. It is highly unlikely a court would agree to make the changes he is suggesting. Hi, my ex and I couldn’t agree over several issues such the child’s surname (has mine since birth 3 years ago but ex wants his name used), where our child will live And what contact arrangements to follow. A child arrangement order was made with myself and the child able to live abroad in(both child and I are Belgians and my ex is British residing in England) and her father was to visit monthly and the name would not be changed. One of the conditions of the court order was for the father to register the court order abroad where I live and that the courts in Belgium has jurisdiction over PR and family matters involving our child. To date, he has not registered the court order, not visited regularly (only visited once and there are no plans for future visits) but had sent me an email stating he will put himself on the English birth certificate and change our child’s name in England and that he is fully capable to do so without my consent.My understanding is that if he wanted to change any of the agreements made in the order then we would need to go back to court, is this correct? My concern is that I’m being told he can go and change whatever he likes without going back to court even though we went to court to agree on these matters and now he’s changed his mind and I’m concerned how it works as we are an international family with different laws in each country. As far as I am aware, because he has not registered and activated the court order in Belgium, it does not apply here but would apply if my child and I were to be in England for any length of time although there are no plans to go to England. I have a court order in place and I want to make some changes to it. I have sent an email stating what I would like to change to my ex and she is saying because in court the judge asked her solicitor to type up the court order, if I want to make any changes I have to pay her solicitor is this correct? Any changes to a contact order must be agreed by both parties. One party cannot unilaterally decide to change the order or apply additional terms. If they wish to do so, they will need to refer the matter back to the courts, or agree through a solicitor or mediation. If you are the parent who wishes to make the changes, then it is not up to the other parent to help pay, unless the other parent agrees to. I have a court order in place and i want to make some changes to it. I have sent an email stating what I would liketo change to my ex and she is saying because in court the judge asked her solicitor to type up the court order, if I want to make any changes I have to pay her solicitor is this correct? My ex went to court falsely claiming parental abduction and the short of it is that it was proven false and then a child arrangements order was made which stated contact arrangements for our daughter. My ex has never followed this order and in the last 3 years has only seen her twice, the last being in July. He’s ignored all my attempts of contact to him (texts,calls,emails) and our daughter was first very upset but has now stopped asking about him. Is there anything I can do to get the order changed as he doesn’t follow it nor does he want to. In court he stated he wanted to visit every 6 weeks but never followed the schedule he chose and I’m concerned that leaving contact open as I have done will be more damaging to our daughter as she cannot understand why her daddy dips in and out of her life whenever he chooses. He’s previously been threatening me that he will take me to court for not following the order when I told him that two sets of dates he gave me were unsuitable (as we were on holiday) but apart from that he’s not mentioning and definately not committed to following the Order he took me to court for. Me and my ex we sign a child arrangement in January regarding school arrangement. We made few changes in the summer holiday but just for the summer. When I asked him to respect the agreement as school start next week he replied that the agreement as not validity as I have move house and there is my old admin it. Can he do that? Hi my partner has had a CAO for 2 years now and it was working ok but over the last few weeks we’ve been finding out a lot of things which raise serious concerns of emotional abuse especially with his eldest who’s 10. We spoke to a solicitor social services and police for advice and they said under safeguarding to stop contact and reapply back to court. We’ve done this and are filing the application in a few days when we have the money but I’m just wondering is this right? She’s been giving him alcohol, sending him back here with a non retractable Stanley knife, and he’s sat down and told us that she follows him round when he’s on the phone and he has to lock himself in the bathroom to get away from her. She tells him he’s not allowed to tell his dad certain things so he worries about talking to us because she has a go at him. She was emotionally abusing him before they came to like with us and it obviously hasn’t stopped. Do you think the judge will understand? We’re still going to let them ring her so they’re not completely cut off but will have to monitor it, and will be arranging a supervised visit for youngests birthday in 2 weeks. Also would I file as urgent or is it non urgent? If there is a court order in place that doesn't specifically allow for an overnight stay and you take your children overnight without the consent of your ex, she can ask the police to intervene and bring them home. Any deviation from the essential terms of the order would be considered a breach. Your only recourse for a variation of the order is either via mediation, or if your ex doesn't agree to attend mediation then you would have to refer the matter back to court. My step daughter's mum has accused the father of hitting his child.Police looked at the evidence and dropped the case.Social care are currently investigating the mum for making false claims, coercing the child and blackmailing her to say things against her father.As a result of all this work until it is concluded the child is not allowed to visit us and she will be missing our family holiday which we have paid for.I want to sue the mum as this is not the first time she has done this to us.For the last 3 years counting its been this cycle all to spoil our summer holidays. Court order in place to collect child Fri 6pm return sun 10am. Went to collect this evening as ordered mother refused. No explanation. I know child with be with her grandmother in the morning while her mother is at work. Could the police assist as I have parental responsibility? Or will I have to return to court?